The classroom where Wee Kim taught in 1863 was very different to those at St Margaret’s Schools in Singapore today . St Margaret’s Schools in Singapore (primary and secondary) proudly celebrated their 170th anniversary in 2012. The Primary School states in its Mission “The school was established for the education and nurture of young girls, that each may develop in body, soul and spirit, and be trained in righteousness to become a woman of God, equipped for every good work”. The girls only need to look back at the early history of the school for the inspiration to fulfil that mission. 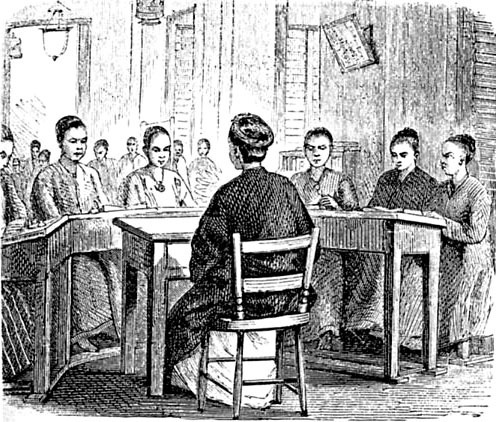 Maria Dyer founded what was originally known as the Chinese Girls’ School and in 1843 the Society for Promoting Female Education in the East (SPFEE) sent Miss Grant to become its principal. In 1939 it became a day school for girls of all races and in 1949 was renamed as St Margaret’s School in honour of Queen Margaret of Scotland. The separation of the school into primary and secondary took place in 1960. The Singapore she saw had come a long way from the little fishing village where Raffles had planted the Union Jack in 1819. By then it was a major trading station with a very cosmopolitan population. In the port she would have seen British clippers, Malay sampans, prahus from Borneo and Chinese five-masted junks. About 40,000 people lived in the town, on reclaimed land along the southern bank of the Singapore river. Many were itinerant traders and those seeking their fortunes before returning home to Europe, America, India, the Far East and China. Miss Grant fell in love with the Chinese Girls’ School (CGS) and its 21 pupils, aged between six and 16 and mainly Chinese Malays. The day after her arrival in Singapore and “worn out with inactivity on board ship” she started work. She described the schoolroom as airy with a good gallery and a number of lesson books hung around. She found “a nice intelligent, pleasing set of girls, that in point of mind and manners would do credit to any English charity-school. On the whole I should say that these Chinese children quite equal the English in point of ability, and generally speaking, are lively and ardent in character.” In the first few months she was very happy to leave the rice and curry department with Mrs Dyer for that “sadly nonplussed” her. The CGS was the most successful of all the attempts by Christian missionaries to run girls’ schools in what were then known as the Straits Settlements (Penang, Singapore, Melaka and Labuan). That might have been because Mrs Dyer had changed the way she worked with girls’ schools. 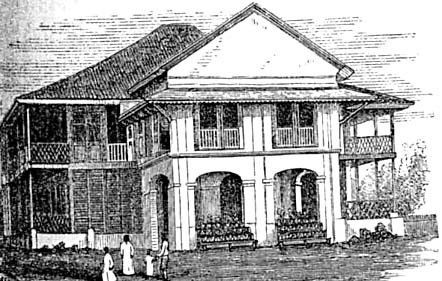 When she had visited Melaka in April 1832 she had helped to set up seven schools to be supervised by Mary Christie Wallace following the same formula as Mary Ann Cooke Wilson had used initially in Kolkata. But like Mrs Wilson Mrs Dyer altered course and focused on just one group of girls, whether in a school or an orphanage. In Singapore she followed in the footsteps of Lucy Ball, the wife of Dr Dyer Ball of the American Board of Commissioners for Foreign Missions who had set up a boarding school for Chinese girls soon after arriving there in September 18381. For the sake of her health the Ball’s moved to Macau in 1841 and then to Hong Kong where she died in June 1844. The two eldest boys already attended a Christian school and the three girls immediately joined Mrs Dyer’s when it was opened in a shophouse in North Bridge Road. The two eldest girls, Chunio and Hanio, assisted their mother with the management of the youngest pupils. Mrs Dyer had immediately introduced the system of making contracts with parents so that their daughters would remain at the school for a set period of time, usually three years. This acted as a guarantee that the girls would not be suddenly removed to be married. She asked the SPFEE to send a trained teacher so that the standard of education could be improved especially as she expected to move with her family to one of the newly-opened treaty ports in China when her husband, Samuel, returned from a missionary conference in Hong Kong after the first Opium War. But he died of a fever in October 1843 and was buried in Macau. Following that conference there was a migration of missionaries from the Straits Settlements to the Chinese treaty ports. Mrs Dyer2, however, went back to Penang. At the school she formed an especially close bond with Chunio and Hanio. She explained that the “nio” adjunct was one of politeness and was equivalent to “Miss”. The girls, who were from a wealthy Hokkien family, became school monitors and Christians. When they left in 1845 the number of pupils had grown from 20 to 29 and the head girl was 13-years-old. Miss Grant reported that the first class was well-behaved and intelligent but the remainder, especially the third and fourth classes, were very wild. That was not surprising for some must have been quite traumatised. Many had been saved by from being auctioned as slaves for the homes of the rich. It was such girls who had moved Mrs Dyer to set up the boarding school. The school was often very noisy for, as Miss Grant noted, all the classes were held in one large room. If she was teaching one class religion another might be learning how to spell. “They are very fond of affording me audible proofs of their industry (in spelling), by learning pretty loud,” she commented. In early 1851 a nice, respectable, good-tempered looking middle-aged Chinese woman, Bee-bee-kin (Bibi Kin) entered Miss Grant’s classroom and asked if her adopted daughter could attend for fortnight to see if she wanted to stay there. Anleang was about 14-years-old and usually a Chinese mother would have been organising a marriage for her. But Bee-bee-kin was disappointed that Anleang, whom she had adopted when just a small child, had such a peevish, perverse temper. After a few months Anleang’s mother was so struck by the change in her daughter that she often visited the school, sometimes spending whole days there. She even placed her small orphaned niece and nephew at the school and later became its matron. Anleang was baptised as a Christian in 1853 and one of the witnesses was Sophia Cooke who had been sent by the SPFEE to take over from Miss Grant. Anleang went on to be confirmed and became a teacher in time for the arrival of a group of slave children in November 1859. The six girls, who had been bought in China to be sold in Singapore, were rescued by the Police and delivered to Miss Cooke. “They knew not what awaited them in the strange house with the white lady,” she recalled. She described their howling when they arrived as deafening and reported: “They pulled down their hair, beat themselves about, saying they had better die than remain there; and they refused their food. This was an unpromising beginning; but Christian love and firmness triumphed even over some of them.” Two, however, had to be returned to the police and one ran away. Of the other three two had become Christians by November 1860. In 1861 Miss Cooke told the SPFEE that she had 12 girls who had no other home than the school. For them and other girls who had no means of support she sought sponsors in Britain. When the police delivered five more small slave girls (Tien, Choon, Sien, Jin and Inn) she managed to find sponsors for three of them. Older girls took on the task of being their surrogate mothers and all were raised as Christians. When it came to finding husbands for those who had become Christians it was Miss Cooke who often helped with the matchmaking. She was assisted by Ellen and Benjamin Keasberry. The Rev Keasberry had chosen to resign from the London Missionary Society rather than leave Singapore in 1843. The LMS gave him its printing press and with this he was able to support his family and his mission work among the Malays. Many Malay speaking Chinese Christians attended his chapel and several would seek wives from among the graduates of Miss Cooke’s school. True to her protestant beliefs Miss Cooke stood out against vanity and so Gek, the first graduate whose marriage was organised by the school, had to wear a very plain dress. Miss Cooke recounted: “The people dislike change of any kind, and Gek was subjected to a great deal of trial on account of having deviated from the ‘customs’. ” She therefore accepted, on behalf of the school, a donation of a new wedding dress. Anleang was the first to wear this dress of crimson brocaded silk trimmed with rich embroidery and an embroidered yellow silk petticoat. But by Chinese standards even that dress was only worn by the poorest of brides. 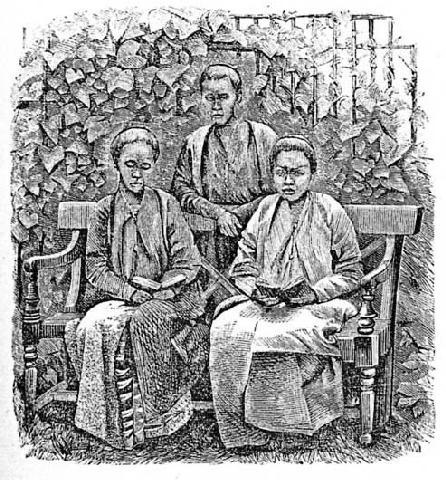 Engraving – from left Anleang, Tempang and Wee Kim. Anleang’s husband, Ah Tak, was a Christian who was working as an interpreter at the police court in Singapore. She gave up teaching at the school just before her marriage in December 1862. She wrote to the SPFEE: “I wish to thank you all, dear friends, so very much, for your great kindness in providing for me, not only for my body but especially my soul. I have had a very happy home in this school for fourteen years. I am so sorry to leave it and dear Miss Cooke; but I shall live as close to the school as I possibly can.” The school had moved to a new building (pictured below) earlier that year and the graduates who had converted like Chunio and Anleang wanted to create a Christian area around it. Miss Cooke then visited England and the school was run by Miss Ryan who had joined the CGS in Singapore. Miss Cooke returned in late 1864 full of enthusiasm both for Ragged Schools and for the Christian Revival she had witnessed in England. She was accompanied on the journey back to Singapore by Miss Houston. The latter took on the job of starting Ragged Schools in early 1865 assisted by the oldest pupils. One of the ragged schools was based in Tempang’s house as she was married by then. Anleang managed the housekeeping at a ragged school until she became ill after delivering her second child. She died in August 1867. Wee Kim continued at the school until the early 1870s taking on responsibility for the housekeeping as well as teaching. She was described by Miss Cooke as a diligent teacher even though she was more timid and retiring than Anleang. Wee Kim wrote in April 1866 that the nine girls in her class were reading in Malay and English, wrote nicely, did sums and a little geography. She added that she tried to teach them useful things like sewing, cooking and cleaning. By 1875 she had married “Ah Ling” (Moy Ling) and gone with him to Melbourne where, according to the CMS Church Missionary Gleaner in 1894, he became the principal Methodist missionary to the Chinese there3. In 1875 Wee Kim wrote to SPFEE thanking them for offering support if she was able to start a school in Melbourne. She added: “The church being in the heart of the city, they (the Chinese) turn to us… and they are taught to think about the true and living God.” Moy Ling became the superintendent of the Chinese Methodist Mission in Victoria and was described as a quiet man who was highly regarded by the leaders of the Methodist Church and held in great respect by his countrymen. Miss Cooke had no doubt that one of her major objectives was raising Christian women who would make good wives for converts like Moy Ling by not only being well founded in the Christian faith but also being able to run a good household. This was the aim of all the schools run by missionaries for Chinese girls in the Straits and later in China. But Miss Cooke went one step further. She was not just a SPFEE agent – she was a missionary. And she taught her girls to be missionaries. 3 The principal Chinese missionary in Melbourne at that time was “James” Lee Moy Ling. He had migrated from China to Daylesford near Melbourne in 1856 during the Gold Rush and was converted to Christianity at Daylesford Methodist chapel in 1865 . Later, as a catechist, he established the Chinese Methodist Mission in Little Bourne Street, Melbourne. He and Leong On Tong were, in July 1872, the first Chinese to be ordained as Christian ministers in Australia. When On Tong visited China to find a wife Moy Ling asked if a Christian bride could also be found for him. With thanks to the British Library for photocopies of engravings in The Female Intelligencer. Thank you for your write-up regarding St Margaret’s school and Sophia Cooke. It was informative and brought back fond memories. You mentioned in a paragraph concerning BP Keasberry and his wife …”She was assisted by Charlotte and Benjamin Keasberry”. This is incorrect. Charlotte Parker was Benjamin’s first wife and mother to Datin Meldrum. She passed away in 1845. Keasberry then married Ellen Luise Scott in 1846. Ellen was the niece of William Scott of Scotts Road Singapore and grand daughter of Captain James Scott, co-founder of the island of Penang. It was she who opened up the Keasberry girls school in Mount Zion alongside her husband’s school. Datin Meldrum taught also in Ellen’s school (teaching the young Sultan Abu Bakar) until she moved to Johore with her husband Dato Meldrum to open up the new town of Johore Bharu. Ellen and Rev BP Keasberry are my wife’s and children’s direct ancestors.